“Unnnhh,” the Minotaur says to no one. Jon Seagroatt: electronically extended woodwind, electronics, iPad apps, audio bricolage & manipulation, mixing. Ian Staples: slide guitars, electronics. Bobbie Watson: words & vocals. ’Deathless’ is the latest collaboration between myself and Ian Staples. It is a 45 minute long sequence of seven meditations, two interludes and two exegeses for electronically extended reeds, slide guitars, electronics and iPad apps, plus two vocal settings featuring my wife, Bobbie Watson. These thirteen musical texts are located within a narrative and structural framework. The project draws its sonic fingerprint from a signature mix of extended instrumental techniques, digitally processed reeds, slide guitars, electronics, iPad apps, sample manipulation, drones, re-purposed improvisation and disrupted song. The elements of ’Deathless’ have evolved and coalesced around the legend of the Minotaur, as refracted through the prism of Steven Sherrill’s novel ’The Minotaur Takes A Cigarette Break’. In Sherrill’s re-imagining of the myth, the Minotaur is not killed in the Labyrinth by Theseus, but escapes to wander the world as a mendicant immortal. Setting his novel in the late twentieth century, Sherrill has the Minotaur living in a trailer park, and working as a short-order chef in a southern USA roadside diner. The novel is a poetic meditation on ageing and memory, passion and redemption. Above and beyond the obvious concerns with making and recording the music, editing, mixing and track sequencing etc., I also had an overarching ‘strategic’ consideration. Namely, to give a narrative arc – and thereby meaning – to something as inherently meaningless as a set of improvisations. I’ve never been ‘precious’ about the magic of the improvised moment, especially once it is recorded. For me, a recording of an improvised event is NOT at all the same thing as the performance itself. Leaving aside questions of mixing and material selection there is the issue of pattern recognition. We just can’t help the human brain’s ‘pattern recognition’ and ‘mapping app’ kicking in when we listen to a recording, and pretty soon we’re anticipating that big old guitar chord or that particular skweeel on a saxophone. In our mind’s eye we begin, in effect, to hear the piece as if it had been composed. This may, of course, point the way to an argument that improvised music should NEVER be recorded to retain it’s elemental freshness and unpredictability……. Given all that I’ve said above, I really don’t have any qualms about editing improv stuff if I feel that editing would be of benefit, and it was from that basis that ‘Deathless’ developed. I had also become aware, through long involvement with improvised music, that an astonishing amount of material is played and / or released – almost by the minute – that appears to simply be a chunk of music or organised sound…..and, well, that’s it. It’s a bit of organised sound. No explanation. Take it or leave it. Mostly, we leave it. What is any (potential) audience supposed to make of that…..? What audiences tend do at a multi-performance event is give the same polite applause to everything. A truly relativist response. We don’t want to seem like we don’t know what’s going on, nor do we want to be ‘fooled’. Think of walking into a gallery, and the only thing in it is a bucket and a mop. How long are you going to risk being in there for…? Well, about as long as you judge it takes to balance an ironic appreciation of an ironic piece of art with the fear that the cleaner will be back in a moment. Or, polite applause, as we might call it….. There are tens of thousands of toilers over highly personalised tables of electronica or with highly idiomatic instrumental techniques (or both) producing thousands of hours of……stuff. There are a handful of venues where it can be played, and a tiny number of people prepared to be an audience. Supply simply outstrips demand by a thousandfold, (at least). We hoped that with ‘Deathless‘ that we might engage audiences by giving the music the advantage of motivation and structure (a ‘back-story’, you might say). We put out explanatory programmes at gigs, and talked to audiences about what we were doing, and why. This worked – not surprisingly – and audiences at last had a ‘way in’ to talk to us about what we did after performances. Despite this, and because of the perceived limited appeal of ‘this kind of music’, we have struggled to find a label for the album – even given the extra appeal of Steven Sherrill himself being willing to come over and do some joint performances. Finally, we chose to release ‘Deathless‘ in a limited run on our own label, ‘Future Vinyl’. The album is available for £10 plus p&p from us via Paypal here, or from us via Discogs. Alternatively, for £7, you can download the digital version from Bandcamp. 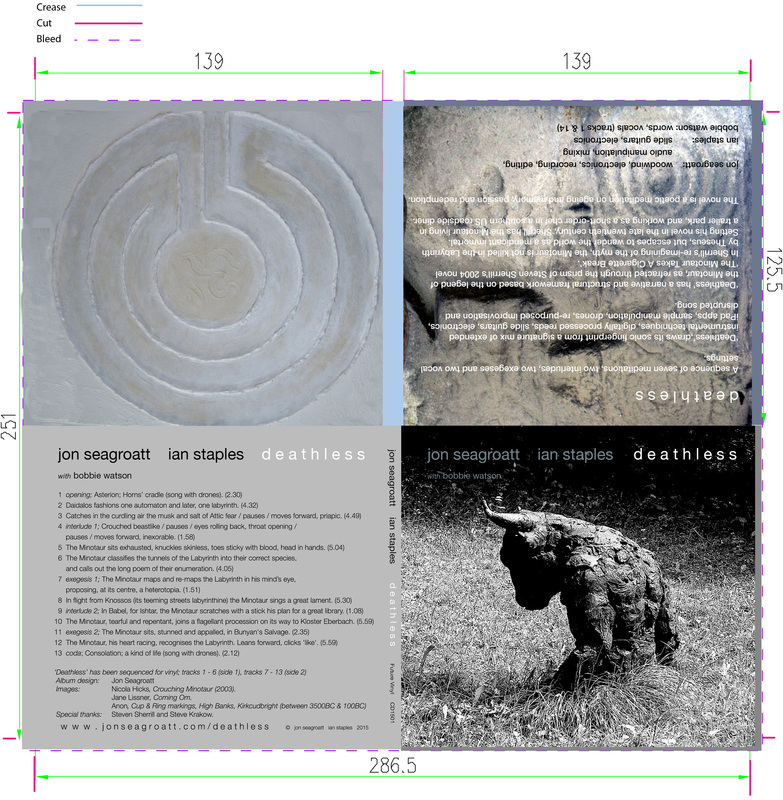 This obviously doesn’t come with a digipak case, but you do get an image file of the complete cover (see above), and a drawing of the Minotaur by Ian. In December 2012 we previewed material from the album at the Old Fire Station in Oxford at the invitation of Oxford Improvisers. The following short film is by video-maker Colin Harrison. It includes material that he shot during that concert. 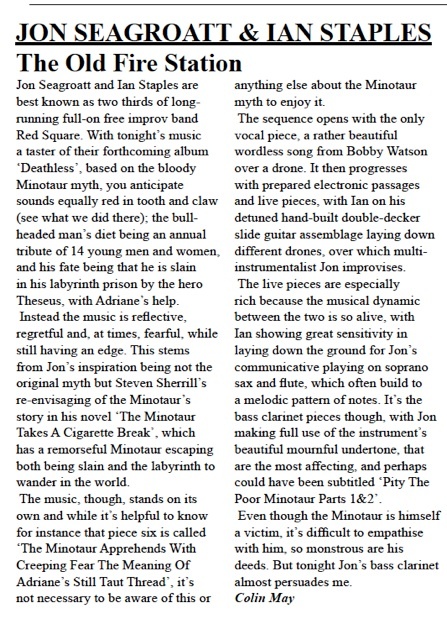 Below that is a review of the event by Colin May of Oxford’s Nightshift magazine.